At Sperling Prostate Center, we believe in exploring all cancer detection methods in search of the earliest, most accurate, and least invasive methods of disease discovery. In keeping with this forward-thinking approach, we have implemented a powerful and advanced new diagnostic tool into our program that utilizes genomic testing in the appropriate setting. Did you know that as many as 1 in 4 men who receive negative biopsy results may still have prostate cancer? This is due to the highly limited nature of conventional TRUS biopsy which samples less than 1% of the entire gland. 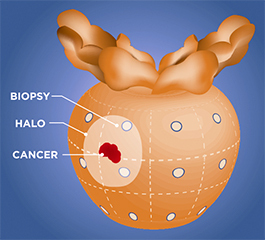 We recommend 3T Multi-Parametric MRI-guided biopsy because of its real-time 3D tumor visualization, allowing vastly improved targeting while being much less invasive. Now, the addition of epigenetic analysis offers an additional level of accuracy in diagnosis—and peace of mind for our patients. ConfirmMDx genomic analysis of prostate cancer works at the DNA level to help distinguish patients who have a true-negative biopsy from those who may have occult (hidden) or extremely early stage cancer. This works by identifying the Field Effect—an epigenetic field or “halo” associated with the cancerization process at the DNA level in cells adjacent to cancer foci. This epigenetic halo around a cancer lesion can be present despite having a normal appearance under the microscope or even at times on an MRI image. Since these changes appear only at the molecular level, they cannot be seen by the standard microscopic evaluation or even the most advanced mpMRI study. Oncotype Dx – Once a prostate biopsy has been done, the tissue samples can be used for this further analysis. Based on the activity of certain prostate cancer genes, Oncotype Dx assigns a Genomic Prostate Score. The score indicates the probability that, if left untreated, the cancer would progress and eventually spread. For patients considering Active Surveillance, as well as those who will be treated, this helps both patient and doctor make an informed choice. ProstaVysion – This analysis also uses biopsy tissue to examine a sequence of certain genes. By determining the genetic aggression profile, it can help predict the risk of future growth and spread. In particular, patients considering Active Surveillance can be guided by the results of this profile. Prolaris – Unlike gene sequencing, Prolaris calculates how fast the cancer cells are dividing as a measure of aggressiveness. Patients whose biopsy indicated low risk disease can benefit from this additional information. This analysis is also often used after radical prostatectomy, when the actual tumor and additional body tissue can be tested to predict the likelihood of cancer recurrence elsewhere in the body. For prostatectomy patients, it can help determine if additional treatment (e.g. radiation or hormones) is indicated after surgery. Are you a candidate for genomic testing? For more information about this genomic prostate test, contact us today to schedule free a consulation and begin your path towards peace of mind.